Once upon a time, there was the Tahitian Terrace. Located in Adventureland between the Tiki Room and the Jungle Cruise, the Tahitian Terrace was a splendid outdoor dining show. Or so they say, since despite being in operation for more than 30 years and despite my growing up in Southern California, I never once ate there. Or even knew it existed. In my defense, for years and years we only went once a year on a private company night and as such, there were many things that didn’t operate at that time of day and year. Like the Explorer Canoes or the fact that you can actually go to the island in the middle of the Rivers of America. I was in high school and there in the middle of the day when I was like “What? You can row your own canoe? Since when?? ?” and people were like “since always?” But whatever. Anyway, never ate at the Tahitian Terrace. 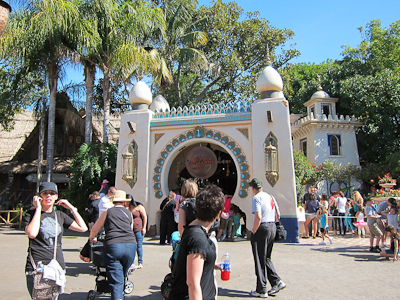 And when the Tahitian Terrace closed and was replaced by Aladdin’s Oasis, I never ate there either. 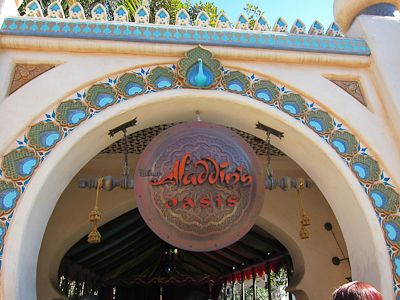 More defendable on that front, since apparently Aladdin’s Oasis was only an actual dinner show for two seasons, both of which occurred when I was in college in the Midwest (where incidentally, I did paddle my own canoe down a river, but that’s a whole other story). That person in the foreground in black is thinking, "Is that a restaurant? I've never seen it open." Well it’s not a restaurant anymore. Let me just put that issue to rest. Apparently for a while it was used as a storytelling location. If this is still the case, I wouldn’t know, because I’ve never seen it open. The entrance is delightfully-themed. The colors are bright, the building is detailed, and it’s all-around a lovely place. It even has a lovely courtyard. An Aladdin meet and greet. It’s always so weird, because the entranceway is lush and decorated and you really feel like any second now it could open up and be come kind of restaurant or show, or both. It doesn’t look neglected or forgotten, it just sits there, totally unused, except for a sporadic meet and greet location. Go figure. 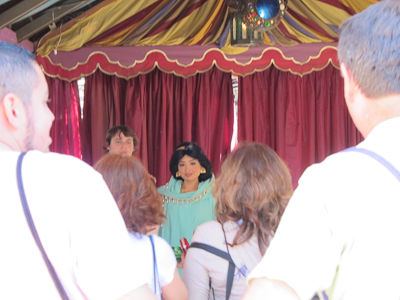 I always wondered why I never saw Jasmine at the princess meet and greet. Now I know! Puzzle solved courtesy of MYWTM! I seem to recall some time in the late 90’s or early 2000’s it used to be a short comedy show (sans restaurant) featuring the Aladdin characters. I didn’t realize it’s been turned into a meet and greet! Yes, that was the “story telling” show. I never made it but I heard a lot of great things about it. It’s disappointing that they stopped it, though. We went about 7 years ago and the story telling show was great, really funny, and the characters came into the audience, the kids loved it. Then afterwards you got an up close meet & great. I think the person in photo #1 is thinking – Why is that gal taking a picture of that restaurant that is never open?! 😆 😆 :lol:!!! I’m sure you’re right ;). When Kingdom of the Crystal Skull came out it was used briefly for a fairly interesting Indiana Jones show. 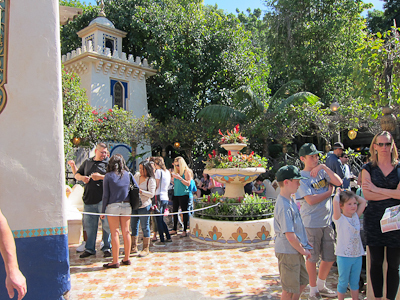 It was a partner to the shows that happened throughout Adventureland proper that did nothing but clog up the walkways even more. I remember the dinner show! Or, more accurately, I remember the chocolate lamp at the end of it!!! I wish I’d seen it! As I said, the show was utterly forgettable, and the only part worth remembering was the dessert. It is nice to be able to say that you have seen it, but there are much finer chocolate creations available at many locations throughout the resort. That’s good to hear. I saw online that they are doing a special dinner show, one night only, for $249 a plate. Even I don’t want to see it THAT badly. I was in the original cast of the Aladdin’s Oasis dinner show. That sucker was a beast to put up due to cramped space backstage and over-ambitious animatronics. The show was loved by patrons, but the high-priced menu was what ultimately doomed the production. It was an expensive venture with a mostly union cast and a full wait staff. We who were in the show saw the potential for it to become as iconic as the Golden Horseshoe Review, especially since many of the cast members were in both shows. I recall the food being very tasty. Since the kitchen was right next to our dressing room, the chefs would sneak portions to us. Thanks for the insight, Hugh! That sounds awesome! Makes me even more sad that I missed it and that Disneyland has no plans to return it.